This absolutely must be posted. Salut! Sunderland’s gut reaction to Max Power’s sending off at Walsall was along the lines of “what an idiot”. Well some of those connected with the site – and many more beyond it – thought so, anyway. But now the red card has been shown to have been a miscarriage of justice and has been rescinded. The appeal many said would be a waste of time succeeded. Jack Ross’s defence of the player is vindicated. Power is 100 per cent cleared. Another black stain on the reputation of League One referees. Following a successful appeal to the Football Association, the red card Max Power was awarded in Sunderland AFC’s game against Walsall has been rescinded. 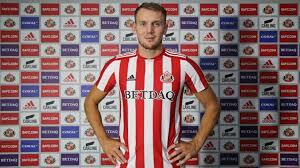 As a result, the midfielder will not serve a suspension and will be available for selection when the Black Cats take on Barnsley at the Stadium of Light on Tuesday evening. Speaking about the decision, Jack Ross said: ‘First and foremost I’m pleased for Max. ‘I was fairly passionate in my opinion on it post-match, and nothing’s changed in that respect, so I’m grateful that those who have looked at the appeal at the FA have seen it in the same light. Sunderland vs Doncaster Rovers: dare we even ask? I didn’t think it was a red card offence at the time and I was even more convinced when I saw the incident on TV on Saturday evening. Funny how so many who weren’t at the game were quick to call the player before they’d even seen the incident. I distance myself from the introduction. Now let’s hope he scores a couple of belters tomorrow. Cattermole, Honeyman, McGeouch, Power. Who will be the next one of our players to become the target of the social media afficiandos? An idea for a new competition perhaps? The first three have proved their critics wrong and I’m pretty certain SuperMax will show just why JR and myself both feel he will have a big say over the rest of the season. If you inferred any criticism on my part from the introduction to Sixer’s Sevens (which we know is the first thing you look at when you get out of the post-match bath [early or not]) please accept my apologies. None was intended. I’m also guilty of condemning Max Power, just on reputation, hadn’t seen the incident. Now I read he had never had a red card before coming to SAFC. His 2nd was very dubious and my first impression when seeing Saturday’s incident, was that the Walsall player should have been sent off for dangerous foul play. Baffled by what these nauseating SAFC boo boys think they saw.